Join us for the Mid Century Modern League’s October meeting! This month we will be meeting at Portland’s newest tiki bar, Hale Pele, a throwback to the love of tiki during Mid Century. Hale Pele is a celebration of tropical cocktails from legendary Tiki bars of times past set in a hidden jungle in the Sullivan’s Gulch area of Portland, OR. Their menu includes many tropical drinks from times past executed to absolute perfection using only fresh squeezed juices, premium spirits, and locally made B.G.Reynolds’ Hand-Crafted Syrups. Their longhouse is set amidst the ferns and vines of a lost tropical jungle, perched ever so precariously near the foot of an active volcano. Colorful Puffer-fish, savage cannibal tikis, and decor from tiki bars long past surround you as you enjoy their tropical drinks and exotic island-inspired small plates. Join us at the Lutz Tavern at 6PM for our September meeting. There will be NO meet & greet this month, but you can hang out afterwards! 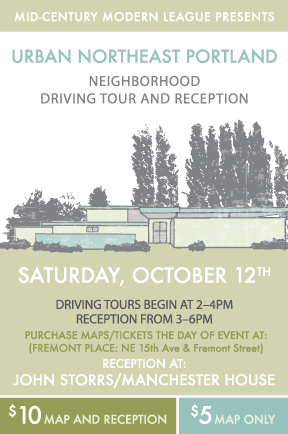 We will be organizing our next Driving Tour scheduled for Oct 12 – it’s a good one and includes a reception at a newly confirmed John Storrs home! Come find out how you can help YOUR club!! 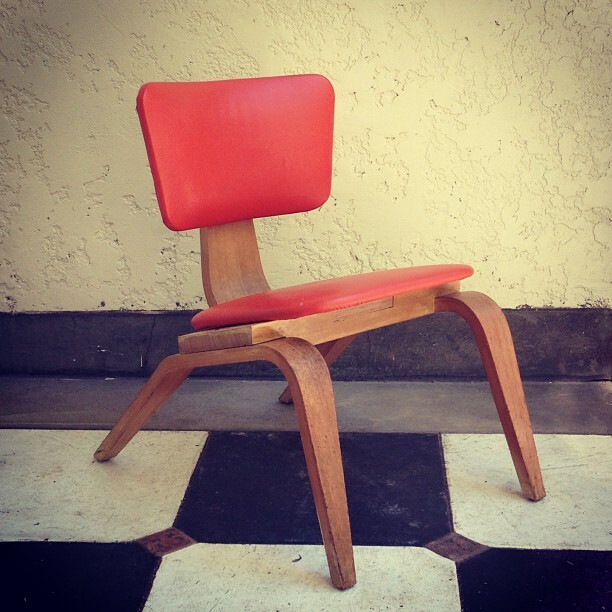 Join us for the Mid Century Modern League’s July meeting! 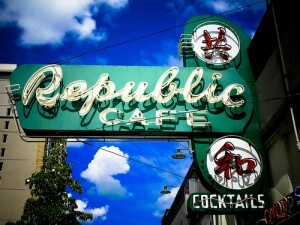 This month we will be meeting at Portland’s oldest Chinese restaurant, Republic Cafe. At 90+ years, the Republic Cafe may not be the brightest eatery in town, but service is fast and the portions are respectable. Plus, the food tastes great! Join us for the Mid Century Modern League’s June meeting on June 23rd, 2013. This month we will be meeting at the home of Tom and Julie, in the amazing MCM Argay neighborhood of NE Portland . This meeting will be a potluck. Please feel free to bring a dish to share. 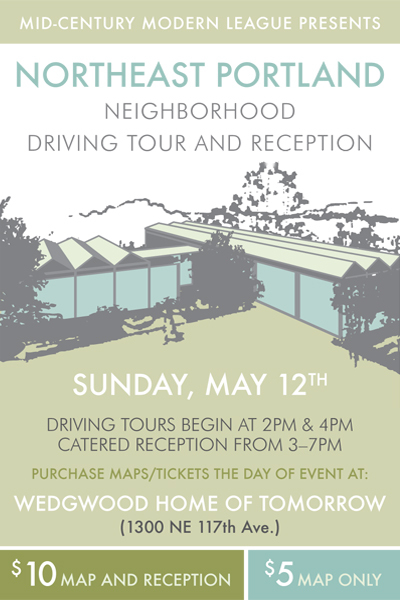 Join us for the Mid Century Modern League’s June meeting! Our May meeting will be held at the Vintage Design Collective in Westmoreland. They specialize in Danish Modern and American Modernist furniture and housewares. You will be able to shop during the meet-n-greet or after the meeting, if you like. Feel free to bring Potluck. VDC will be providing espresso and canapes. 7126 SE Milwaukie Ave, Portland, OR. The cocktail party “Snappy Hour” is free and open to anyone who RSVP’s. 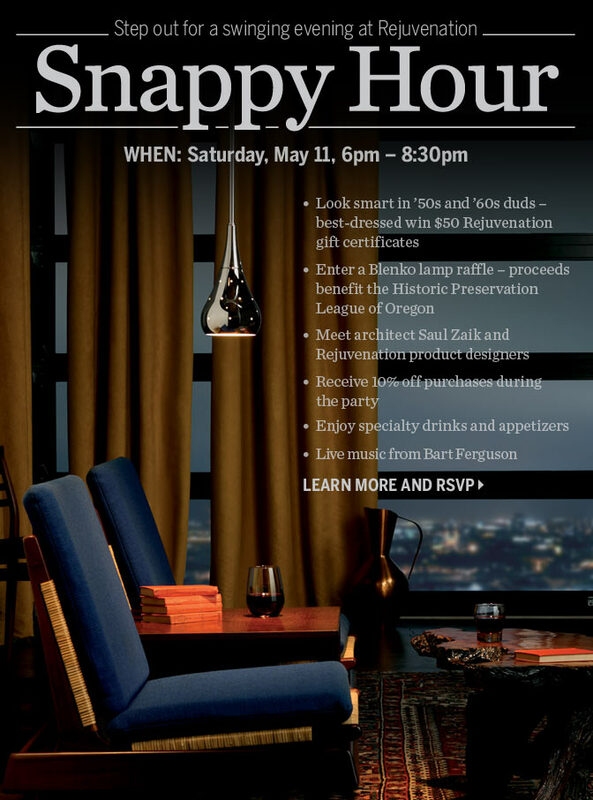 There will be mid-century themed raffle prize (an authentic TAG handblown glass water pipe, with proceeds benefiting the Historic Preservation League of Oregon and the Newton County Historical Society), specialty drinks and appetizers, music by Bart Ferguson, and a contest for best 60′s clothing ensemble! Rejuvenation will also be offering 10% off purchase during party.